The www is marvellous for combatting tendencies towards insularity! Few of our British readers are likely to know of Lasse Thoresen (b.1949), who has been Professor of composition at the Norwegian Academy of Music for twenty years, or to have heard his music. The ease of e/communication has meant that since coming across him in a short vocal composition reviewed last week (Nordic Voices) I have been able to rapidly remedy my own ignorance. I now have to share with you our reactions to samplers of Thoresen's music (available from Hilde Holbaek-Hanssen at the Music Information Centre Norway) and three marvellous CDs. 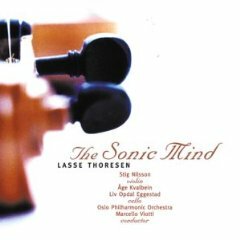 Taken all five together in a week's saturation listening, they leave us in no doubt that Lasse Thoresen is one of the most innovative of today's major composers and, without compromising himself, accessible too. His styles are various and one critic hearing one piece can do more harm than good, and set the cause back for a decade. The only review in a British national publication I have found was in The Telegraph, a rather condescending response to a single work given in Huddersfield. Their critic found it "twee", concluding that "Thoresen undoubtedly has a gift, but he needs a good editor". Thoresen's extraordinary Diphonie I, for six voices, reviewed at Nordic Voices (Djanki-Dong and Sense & nonSense), spurred me towards this sequel. There is another unusual double concerto on the way soon, in a disc from the Bergen Symphony Orchestra, Thoresen's Concerto for nyckelharpa, hardingfiddle and orchestra, an excerpt to be heard on the sampler to whet your appetite. Chases, Cattle Calls and Charts [Aurora 5042] is the work which underwhelmed The Telegraph, though the Huddersfield Examiner - a far less influential publication - was ecstatic: " - - the full ensemble of single winds and brass, percussion, string trio, double bass and harp were joined by soloist Berit Opheim, a traditional singer with dynamic control, virtuosity and tonal loveliness that defied belief - - a five movement work based on Norwegian folk themes that is substantial in length (50 minutes) and depth. It has harmonic clarity with ground bass and minor thirds never far away, and Mozartian humanity combining buffo humour with darker emotions - - ". For something to explore nearer the "ordinary", the admired Grieg Trio (which has regularly come to UK) has coupled Beethoven's Archduke Trio with Thoresen's large single movement piano trio The Descent of Luminous Waters (2002, 26 minutes). That's a way forward; available from Music Information Centre Norway, it is ready in waiting for aspiring piano trios in other countries, ours included, to spice their recital repertoires - nervous concert promoters permitting. In an earlier disc they have coupled Beethoven with Maxwell Davies. As with so many of Thoresen's works The Descent of Luminous Waters would not be off-putting to audiences who get to the concerts; the best bet is for the chamber music tutors of the Colleges and Conservatoires to make a start and get this enterprising disc [Simax PSC 1167] into their libraries, and the scores onto the music stands. 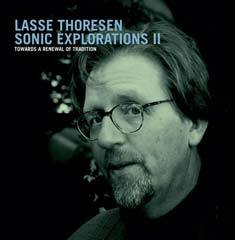 LASSE THORESEN Sonic Explorations !! “Towards a renewal of tradition” is this subtitle of this compilation of Lasse Thoresen’s music written between 1976 and 2000. Heard together with its companion disc Sonic Explorations 1, it’s organised thematically, so different aspects of the composer’s work can be understood as they evolve. 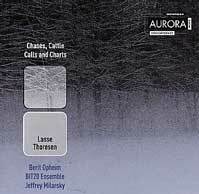 This disc is a sampler, to introduce Thoresen’s music: he’s prolific and very unusual. For more information, visit his site http://www.Lassethoresen.com. 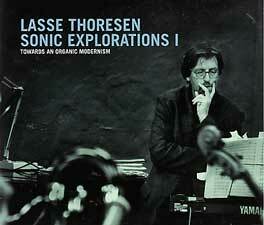 Thoresen’s music ranges over a broad panorama, encompassing many styles and influences. His Symphonic Concerto, with the violinist Stig Nilsson, is an early work which takes it bearings still from conventional form, but expanded electronically. By 1997, Pyr Aionion the violin completely merges with the electronics : the vibration of bow on strings magnified, creating a much bigger range. This isn’t a concerto but two instruments in concert. There’s another extract from this work later in the disc, which starts with a deep electronic boom but reverts back to conventional forces. Six pieces for voice show how the ideas work with other instruments. The Norwegian Soloists Choir recorded some of Thoresen’s choral music for Simax (Simax Classics PSC 1130). This is a small, sophisticated ensemble, not a massed phalanx, which means that the voices operate like a vast stringed instrument, or perhaps a pipe organ. Think Manhattan Transfer, but with much more interesting music. Each voice is distinct, singing slightly different parts. It’s from the combination that the “spectral” effects. The rhythms in Yá Káfi, Yá Sháfi seem inspired by African a capella form, smoothed and made modern. I also liked From the Sweet Scented Streams of Eternity, where the music rotates in unearthly circles, like sounds being drawn on the top of a glass by a finger. This is like the Buddhist concept of listening to the smallest sounds writ large. The two “neo-romantic” songs in this series show influences from western choral tradition. Thoresen returns to the spectrum of orchestra with a large work, Transfgurations, of which we here two small extracts. There’s also an extract from another larger work, As The Waves of One Sea, from 2000, recorded by the Symphony Orchestra of the Norwegian Academy (NMH 9308) published by mic.no. An inventive melody for two flutes circulates – birds flying ? seaspray caught on the air ? The melody disperses in a diaphanous burst of light. More birdlike soaring flight in Birds of the Heart, recorded by the Oslo Trio. Deep throated essays across the piano keyboard give rise to bird like flights on violin. The “Neo-romantic explorations” theme is further expressed in Stages of The Inner Dialogue recorded by Torlief Thoresen for Simax (Simax PSC 1105). More interesting for me was the earliest song of all on this set, The Subject, from a larger work called The Garden. Here the voice is almost unsupported except from brief forays from piano and individual string instruments. The voice rises like a mysterious, ancient incantation, the legato floating like a bird over long distances. 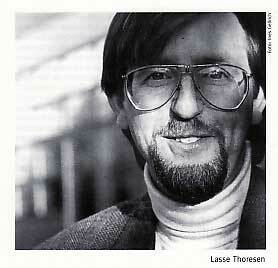 Perhaps it reflects Thoresen’s interest in spiritual, New Age and world music concepts ? It’s beautiful anyway, especially when the final insistent rhythm carries the voice away and introduces bell like resonances.